Binary numbers are commonly applied in computer technology. However, more people prefer to use hexadecimals in mathematics, computations and computer programming because it is easier to understand. The table below shows the conversion of the decimal numbers 1 to 15 to binary and hexadecimals. BIN2HEX function converts a binary number to hexadecimal. 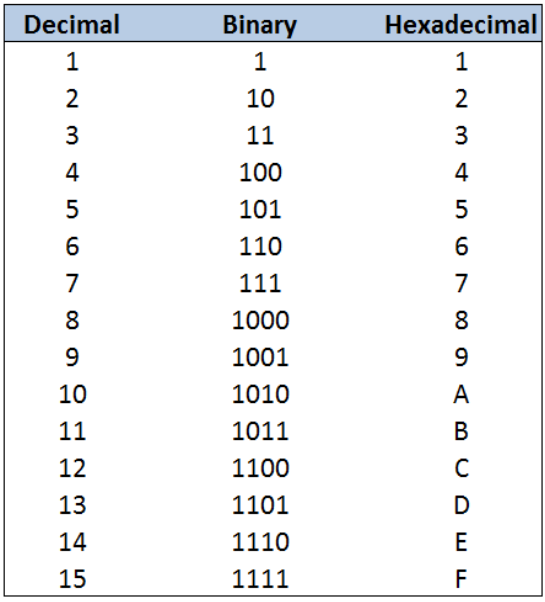 A binary number (BIN) is expressed in the base 2 numeral system, using only the digits 1 and 0; while a hexadecimal (HEX) is in the base 16 numeral system, using the numbers 0 to 9 and the letters A to F.
Below table shows some binary numbers to be converted to hexadecimal. Conversion of a binary number to hexadecimal in Excel in pretty straightforward. The binary number 1100100 is converted to its hexadecimal value of 64. The value for the argument “places” is 3, so Excel adds a zero “0” before the value 65 to return a three-digit hexadecimal “065”. Below table shows the conversion of the largest 8-bit and 10-bit binary numbers to hexadecimal. If the binary number is not a valid binary number, BIN2HEX returns the #NUM! error value. If the binary number contains more than 10 characters (10 bits). If places is not an integer. If places is nonnumeric, BIN2HEX returns the #NAME? error value. If places is negative, BIN2HEX returns the #NUM! error value.